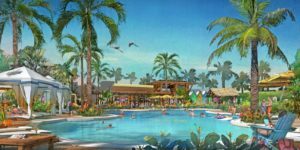 Minto Communities and Margaritaville Holdings today announced details surrounding upcoming events for their new LATITUDE MARGARITAVILLE 55-and-better active adult communities in Daytona Beach and Hilton Head. LATITUDE MARGARITAVILLE Hilton Head, the second community to open, is well underway with its sales center opening on February 17. In addition, the first community in Daytona Beach is unveiling nine new model homes on February 24. 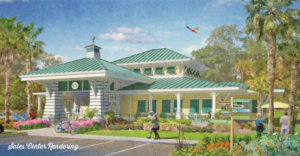 The sales center at the highly-anticipated LATITUDE MARGARITAVILLE Hilton Head will open in true Margaritaville fashion on Saturday, February 17 at 9 a.m. with preview tours, live entertainment, refreshments and more. Upon entering the sales center, visitors will discover the exciting lifestyle at LATITUDE MARGARITAVILLE Hilton Head. Dynamic interactive displays, 3D amenity models, a colorful birds-eye view topo table of the community and a design center will allow prospective home buyers to experience the community lifestyle and create their dream home with a selection of home designs, floor plans, exteri or finishes and premium features. The 7,442-square-foot sales center will reflect the community’s ‘casual-luxe’ design with Bahama shutters, coastal colors and a shaded front porch complete with Adirondack chairs. Phase one of LATITUDE MARGARITAVILLE Hilton Head is currently underway with 203 home sites. Nine fully furnished model homes are projected to open by mid-2018. A wide range of home designs and floor plans will start in the low $200s. Amenities will include a resort-style pool, fitness center, social hall, game and hobby rooms, arts and learning programs, indoor and outdoor dining with signature Margaritaville food and beverage concepts, tennis and pickleball courts, and a 290,000-square-foot Margaritaville retail center, developed in partnership with Sutton Properties, Inc. Buyers will be able to reserve a homesite in phase one, with home sales officially slated to begin on March 10th. Current plans call for 3,000+ homes once the community is complete. A model home grand opening event will be held on Saturday, February 24 from 10 a.m. to 4 p.m. at LATITUDE MARGARITAVILLE Daytona Beach. While taking a peek at nine new designer model homes, guests will enjoy a festive street party with a live steel drum band, Margaritaville stilt walkers, complimentary food and beverages, giveaways and more. The new models capture the “no worries” tropical vibe of the community while maintaining three distinct villa and single-family home collections – the Caribbean, Beach and Island. Visitors will tour four new villa home models – the Antigua, Barbuda, Jamaica and Nevis – that range from 1,503 to 1,862 square feet under air. All include two bedrooms, den or hobby room, two baths, covered lanai and two-car garage. Villa pricing starts at $235,990. Five different single-family home models are available for touring – the Aruba, Breeze, Coconut, Parrot and Trinidad. Single-family homes range from 1,684 to 2,564 square feet under air and feature two to three bedrooms plus den, two to three-and-a-half baths, a covered lanai and a two- or three-car garage. Pricing for single family homes starts at $277,900. LATITUDE MARGARITAVILLE Daytona Beach’s easy-care homes feature open, airy spaces that maximize natural light and flow into uniquely designed outdoor living spaces perfect for enjoying the Daytona Beach climate. These properties are ideally designed for relaxing, entertaining and comfortably accommodating houseguests. Spacious master suites include large walk-in closets and raised height vanities in the master bath. LATITUDE MARGARITAVILLE Daytona Beach is currently selling homes in its first phase of 378 homesites. Current plans call for 3,000 homes, with the possibility of a future expansion for a total of 6,900 homes at buildout. For more information on LATITUDE MARGARITAVILLE and to sign up to receive regular development updates, visit www.LatitudeMargaritaville.com. Follow LATITUDE MARGARITAVILLE on Facebook here.